Rain jackets are useful as they can be folded up relatively small and taken on the go, ensuring you are protected should there be any unexpected showers. In this category you’ll find vinyl and PVC poncho’s, which protect the head as well as the body from rainfall. These ponchos come in normal plastic pouches, as well as convenient balls attached to keyrings, which can be clipped onto bags or jean lapels for quick and easy access. We also have fluorescent runner’s jackets made from nylon and PVC, to help late night joggers stay safe and seen at night. All of the ponchos featured here are waterproof, ensuring the wearer is dry when skies turn grey. Anyone would be happy to receive these promotional rain jackets, because no one wants to be caught in the rain! The next time the weather takes a turn for the worst, your clients will be happy they have your promotional clothing to hand. The rain jacket is an eye-catching promotional product, because it can be purchased in many different colours. We can offer you jackets in the national colours of Germany, Italy, Switzerland, Turkey and the UK. Adding to that, printed rain coats possess four buttons, which ensure good stability. Moreover, thanks to their material and design, they can be fitted very well into bags and backpacks, which makes them easy to transport. 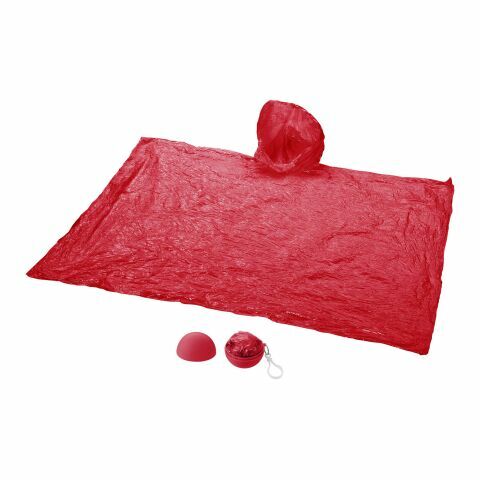 These plastic ponchos make brilliant advertising tools because of the large surface area, where your slogan can be printed. Additionally, we at allbranded, can personalise your rain jacket with your company logo, which will be noticed by all onlookers on the street. Sports events are the perfect occasion to distribute these printed rain jackets. In the UK the weather is notoriously unreliable, which is why we must take the necessary precautions. Whether it be the football world cup, the rugby world cup or the Olympic Games; the colours of your home country or sporting team will help your customers to get into the competitive spirit. Whether as a flag at the house or on your car, on your cheek or on your clothes; people want to show solidarity to their home country. These sporting events are usually viewed with family and friends in pubs or live at stadiums. Stadiums can hold thousands of people, which means your business will be exposed to many of the public. In addition to our rain jacket we also sell promotional clothing perfect for sporting events such as custom printed T-shirts and promotional Polo Shirts. However, should rain fall, these hooded rain jackets will be the first thing people will reach for. As this promotional product is especially suited for sports fans, companies, which sell sports items, should definitely consider purchasing them in bulk. These hooded ponchos are also reusable, meaning your clients will keep and use it for a long time, creating many brand impressions in that time. These promotional rain jackets will protect fans from the weather as they enjoy their favourite teams play. The joy and fun they have at these events will then be associated with your brand in the customer’s mind. These jackets can be customised by having your corporate artwork printed on the front, this combined with choosing the style and your preferred colour will help to promote your brand in the best possible way. Useful, eye-catching and memorable, your customers are sure to keep your company in good memory with the printed rain jacket. For companies, which produce or sell sports items, this rain jacket is a perfect giveaway for their customers. There are many ways to customise this promotional merchandise to make it align with your business aesthetic, from choosing the style, to having your logo printed on the front. If you have any questions about the design process, please don’t hesitate to give our friendly team a call.